To this day, neither Winters Bane, Judas Priest or Iced Earth could give Tim Owens the full-throttle outlet to push forth his own musical might outside of his uncanny technical abilities. Beyond Fear, the new band fronted by the Ripper makes this endeavour finally possible. First of all, it must be said that Owens pulls off amazing vocals. The guy can wail, gruff and croon with the best of them. In my books, he is one of the very few “newer generation” singers that can be easily included in the same league with the legends like Dickinson and Halford. The man was born to sing metal. Especially his manic distorted high notes are out of this world. The music on BF’s debut is of very high quality. The killing opener Scream Machine grinds necks into oblivion with powerful riffing and a frenzy tempo. Ripper banshees the tune home with ease. Onward from there the song material takes an even level of “very nice” – takes it a bit too far. The band mixes Priestesque melodies and riffs with modern, strong production and occasional rhythmic jabs that remind me of Disturbed. Some tracks, like Telling Lies display awesome Pantera-grooves that kick off an instant slam dance-mode. Words Of Wisdom has Owens sounding seriously pissed, sending off great energy. But overall not much stands out from the crop. For example, Dreams Come True, the “mandatory” ballad of the album is OK, but not that special. A lot of the songs suffer from a similar mid tempo-pace, which makes many of them resemble each other too much. The band’s playing is stellar as the backbone stays together nicely amidst the shredding solos-a-plenty and thundering riffs. Lots of double bass pounding and harmony guitars are splashing all over the place. 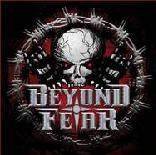 Beyond Fear’s self-titled album is a classic case of an album which namely has nothing wrong with it and technically speaking is brilliant. The song craft just isn’t up to par with the best of them out there at the moment. Ripper’s singing is really what raises this album a notch above the greyest of “It’s alright”-mass. The album mixes the old and new schools of metal very well, so I would recommend it to anyone looking for quality headbanging.